Moms, after a long busy day running errands, taking the kids to school, or in my case, commuting on the rail to work, we are like zombies from The Walking Dead. Our days are filled with busyness, which at times can cause stress, and maybe sweating and odor. New moms can relate, too! We know that things like showering become luxuries once a new baby is thrown into the mix. The last thing us moms need is another reason to stress, which is where the new Secret Outlast Completely Clean Clear Gel comes into play. The new Secret Outlast Completely Clean Clear Gel offers 48-hours of odor protection, and, unlike my invisible solid, it is free of white marks. This means that during the days where I’m running, running, running, and take a little bit longer to shower that day, I know that I don’t have to stress out on whether or not my armpits are fresh and dry because I know protection is just two clicks away. The fast-drying formula is perfect, especially for those days when you’re in a hurry. But, when do we not have those days? Exactly! 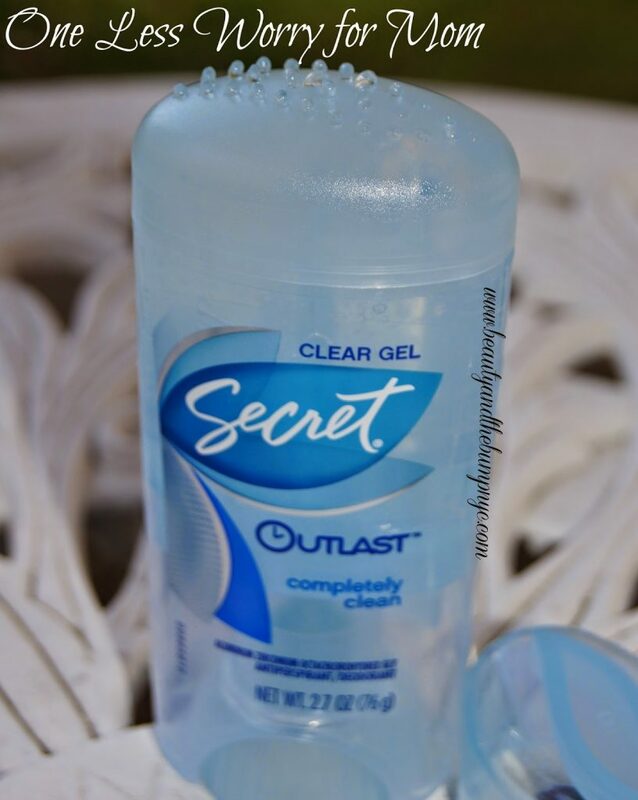 The new Secret Outlast Completely Clean Clear Gel doesn’t leave your underarms feeling damp or sticky like other clear gel formula deodorants I’ve tried. I’m left free to put on my top, in a hurry, without worrying about the deodorant getting on my clothes. And my underarms say dry and fresh throughout the day. My only issue with the deodorant is that when turning the dial to dispense more product, the Secret Outlast Completely Clean Clear Gel has rogue pieces of gel flying out. It’s not a lot, but, it is still annoying. Also, wherever the Secret Outlast Completely Clean Clear Gel is stored, it takes on that temperature. For example, if it’s stored in a cold area, the gel will be cold. Just keep that in mind if you’re thinking about purchasing it. Overall, I think this is a good clear gel deodorant that actually works, and doesn’t mess up your clothes. I’d definitely recommend it for busy moms like myself, or for any woman who is in a time crunch, and doesn’t want to stress about odor and sweat. The new Secret Outlast Completely Clean Clear Gel can be found on Amazon.com in two scents: Completely Clean and Protecting Powder for $3.99. Disclosure: Product provided for free via BzzAgent. All opinions are my own and are honest.